Your guide to launching an internal employee swag store and selecting the merchandise that best represents your brand. We all know that employees need branded clothing. The question is, do employers really need to go through the humdrum process of handing out catalogs, collecting information like size specification and then coming out to collect cheques? A better solution is an online company store for employees. In today’s internet era, it is highly likely that some employees, especially of the younger generation will not even have cheques anymore. And collecting money is less than fun in an age where people never have to provide exact change. Meanwhile, passing out order forms is and catalogs are going to do nothing to boost employee morale, and may be off-putting to employees who are looking for a company is on the leading edge. Most importantly, this tedious process is a huge time waster and an inefficient drain of company dollars. So why is a company apparel store for employees the answer to these problems? Read on to find out why. What Exactly are Company Stores for Employees? An online company store for employees is a one-stop shop for employees to freely purchase fashionable company merchandise at their leisure through the use of a simple online platform. By allowing employees to order directly from the distributor, this innovative system effectively eliminates the need for the employer to play middle man between the branded product provider and the employees themselves. Branded online stores are available exclusively to company employees, which creates a natural incentive to be part of the team. So what type of businesses can benefit from this type of smart technology? The answer is that a company promo store will work great with almost any type of business model. This includes sports teams, not for profits, large corporations, or you name it. The technology is completely accessible. The bottom line is that company stores create an easy and cost-effective way for employees to engage with the company brand whenever and however they want to. Most employers know that employees who feel challenged and appreciated are much more likely to stay at their jobs, but did you know that studies have found that engaged employees are twice as likely to be on top when it comes to performance ratings? This means that creating a way for employees to engage with your brand will actually improve your team’s overall performance. Talk about a dynamic solution! A company swag store isn’t just a win for employees, it’s a win-win for everybody. It gives employees access to company merchandise whenever and wherever they want, so they don’t have to worry about going through higher-ups to order new branded clothing when they are in need. Even better, the ordering process is streamlined and simplified to be both speedy and easy, which means that team member are not only free to engage with the branded merchandise however they want, but can get it whenever they need it. Meanwhile for employers, hosting a company store for employees saves the hassle of having to worry about providing employees with merchandise. This means no more company dollars and resources get pumped into the otherwise banal process of merchandise distribution. Why handle the tedium of ordering and stockpiling employee merchandise when a dedicated account manager can handle every step of the process for you? A company promo store will do a lot more for business owners then make life easier. It will help solidify the brand and the company’s reputation. Not only does a company online store ensure that the brand is distributed in a consistent way that ensures employees will quickly associate the look of your brand with the company philosophy, history and what it represents, but also that it is easy for employees to spread the visual identity of the brand by having easy access to fashionable merchandise for trade shows or social events. Good employees are hard to find, so when you find a stand-out hire, you need to be sure to start things out on the right foot. 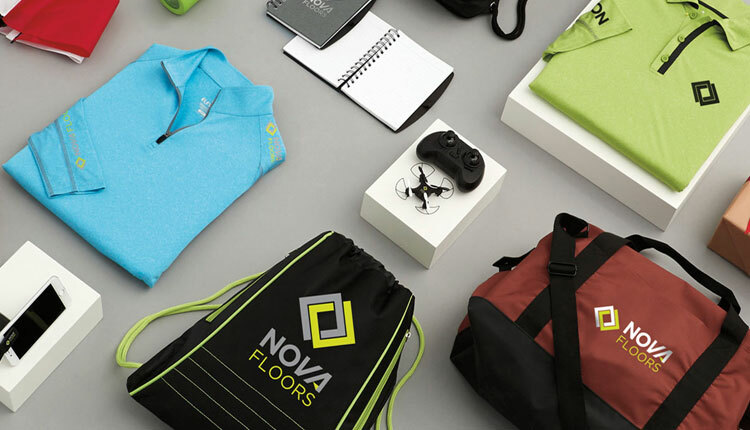 Not only will brand welcome kits help make your onboarding process a cut above the competition with swag that new employees will actually feel proud to rock, but it will also ensure that they don’t feel the need to show up to work sporting a competitor’s branded products. And what better way to make a new addition to already start feeling like a valued part of the team than to welcome them with free stuff that they will actually be proud to use? An online company store for employees provides an ingenious way for employers to associate their brand with top of the line products that employees will be proud to sport. So say goodbye to frumpy merchandise and hello to a branded merchandise that you can be proud of. There is no better way to increase your business presence than to have your employees proudly rocking your gear. What better way to incentivize employees to perform than with the promise of sleek swag? Rewards programs are becoming more and more popular as employers continue to see positive results. It is rare for a company to not have a rewards program of some form or another in place, but what many employers don’t know is that non-cash rewards are far more likely to motivate employees. The thing is that employees are already working for cash. They want something that shows you really care about their contribution. An online company store is a perfect way for employers to create branded rewards packages that superstar workers will be honored to show off. Even better, branded products work great with team building exercises. The only cost of running an online company store for employees is the cost of the site itself, which is minimal compared to all the fantastic returns. Inventory management? Not your issue. This alone is already saving tons of time and manpower compared to more traditional and outdated methods of distribution. So what about set up? If you think it seems like it might be difficult to get started, think again. All you need is seven short days. Read on to find out just how easy it is to get up and running. Did you know that once you are ready to commit to a company swag store you can have it fully operational in as little as seven days? You might be scratching your head and wondering how this is even possible. If this is the case, you are not alone. Many company owners and CEOs mistakenly believe that starting a web store is a lot more time consuming and costly than it actually is. Take a look at how it’s done. The first thing that you need to create a company webstore is a clear set of goals. If this seems intimidating, don’t worry. A dedicated account executive is there to walk you through the process of determining exactly what your company needs to get their swag out there. The point here is to develop a targeted approach that will ensure minimal overhead and the most gain. Can your employee apparel catalog do that? The next step is to research your company to find the type of products that will best represent your business philosophy and company history and backstory while simultaneously propelling your brand forward. This means delivering a range of ideal solutions to choose from that will work within your budget. This is the fun part. It’s time to design a site that represents the feel and look of your brand. An expert designer will work to take this look and bring it to the page so that it is perfect for you. This is where everything starts coming together. At this stage dedicated professional actually set up the nuts and bolts of your online store including admins, assigned costs centers and user accounts. No need to become a tech expert when qualified professionals handle every step of the process for you while making sure that your store is both secure and streamlined. So now that everything is perfect, right down from the site design to the gorgeous branded products themselves, it’s time to get that store stocked up so that you can start selling right away. This is why you have the option of making an initial inventory process so you will be ready to hit the ground running. You love it and you are ready to get rolling. Let’s do it. You can have your online store launched and available to your internal employees just six days later. Who knew this all was so easy? You are up and running. It’s time to spread the word and let the fun begin! Ready to get started? We are dedicated to making the process of starting an online company promo store easy and affordable and providing a forward thinking solution to grow your bottom line like no other. That’s why we are fully dedicated to creating an easy way to extend the reach of your brand while creating a fun and stimulating way for your employees to engage. Reach out to us to get the ball rolling today.